Younger adults are by far the most likely group to use social network sites such as Facebook, MySpace, or LinkedIn—83% of adults 33 and younger currently use them. However, older generations have seen the most dramatic growth over the past two years. Social network site use by Younger Boomers (ages 46-55) increased 30 percentage points over the past two years, from 20% in December 2008 to 50% in May 2010, and Older Boomers (ages 56-64) jumped 34 percentage points, from 9% in 2008 to 43% in 2010. The fastest rate of growth was seen among the oldest generation of internet users, as the percentage of adults age 74 and older who use social network sites quadrupled from 4% in December 2008 to 16% in May 2010. Use of these services for all online adults in this time period increased from 35% to 61% over that same time period. 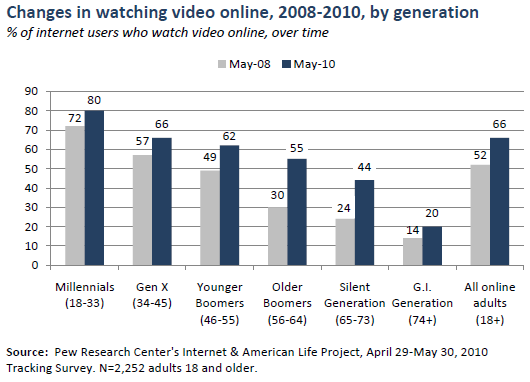 The percentage of all adults who watch video online jumped 14 points in the past two years, from 52% of all online adults in May 2008 to 66% in May 2010. While Millennials are still the most likely generation to watch online video, as 80% have done so, other generations have seen significant growth—55% of Older Boomers have watched video, up from 30% in 2008, and one in five members of the G.I. Generation have watched videos online as well. Over the past few years, comedy video viewership has grown more than any other type of video asked about in our surveys: in 2009 half of all online adults (50%) had watched a comedy video online. In September 2007, only 32% of online adults had used a classified ads website such as Craigslist; by April 2009, this number jumped to almost half (49%) Now, as of May 2010, 53% of all online adults use online classifieds. While roughly four in ten internet users in the Millennials cohort and Gen X had used these sites in 2007, by 2010 Millennials had pulled ahead: 64% of internet users 18-33 have used a classifieds site, versus 58% of those ages 34-45 having done so. 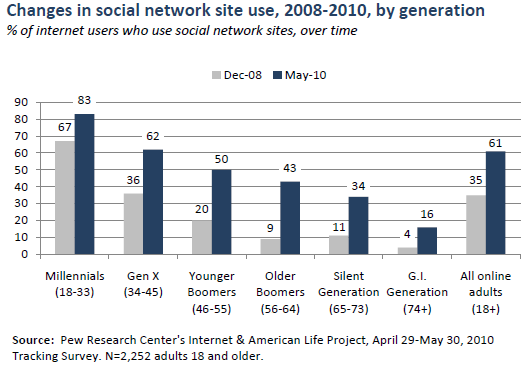 Younger Boomers have also seen drastic growth, with 49% currently using these sites, up from 27% in 2007. Even 17% of the online G.I. 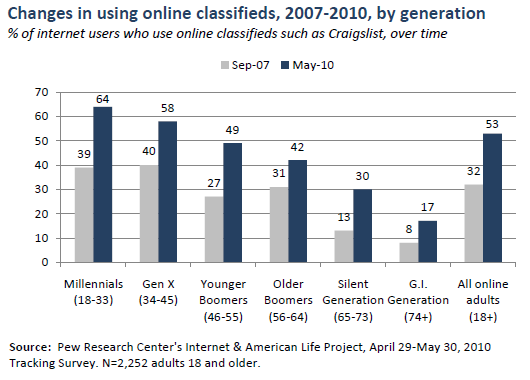 Generation has used a site like Craigslist, up from only 8% three years ago. In June 2004, the last time the Pew Internet Project asked about listening to music online, Millennials were by far the most avid listeners: 55% of Millennials had streamed music online, compared to 36% of Gen Xers and 34% of all adults. As of September 2009, Millennials still lead in this activity—65% have done so—but their lead is more modest, with Gen X and Younger Boomers not too far behind. The oldest generations, however, have seen the least growth. One in four members of the Silent Generation streaming music, and the G.I. 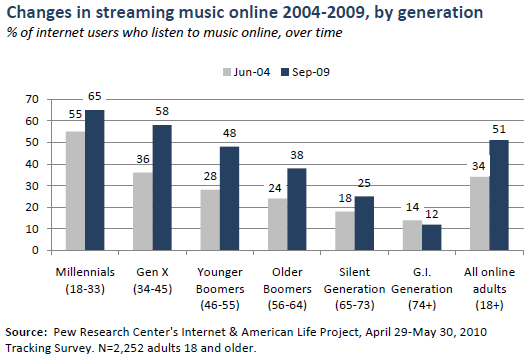 Generation still listens at roughly the same rate: 12% in September 2009 versus 14% in June 2004. 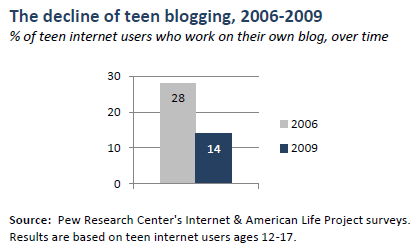 Only 14% of teens ages 12-17 worked on their own blog as of 2009, a drastic decrease since 2006, when twice as many (28%) said they had done so. Millennials have also seen a decline in blogging over the past couple years, from 20% in December 2008 to 18% in May 2010. As previous Pew Internet research has noted, it is possible that status updates and other functions that are incorporated into increasingly-popular social network sites may be replacing stand-alone blogs for young people. Yet while blogging is less common for internet users under 34, it has increased in popularity among most older generations. 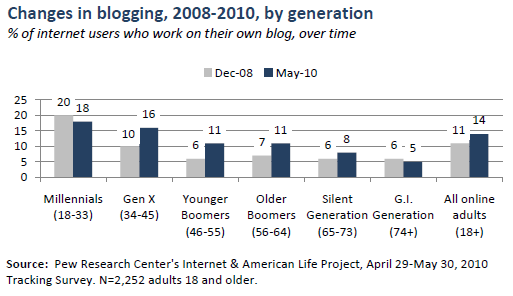 Blogging among members of Gen X increased from 10% in December 2008 to 16% in May 2010, and 11% of Younger and Older Boomers currently blog as well. The result is a slight increase in blogging for adults overall, from 11% in late 2008 to 14% in 2010. 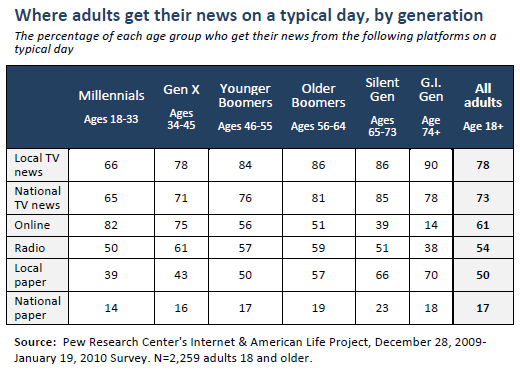 Though the percentage of all internet users who get news online6 has not changed dramatically since the first “Generations” report, the oldest generations have experienced notable increases. In November 2008, 37% of internet users 74 and older said they had gotten news online, but by May 2010 that number had jumped to 54%. 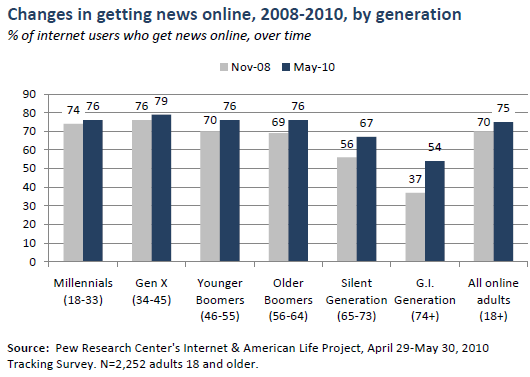 Similarly, 67% of internet users ages 65-73 now get news online, compared to 56% in November 2008. Despite the modest growth in the overall percentage of adults who get news online, the ways in which people find and share their news are very different than they were when the Pew Internet Project first started asking about online news consumption earlier in the decade. As previous reports have noted, information is now portable, personalized, and participatory; people access news on-the-go and discuss it online with friends and family. In terms of where people get news in a typical day, the internet has surpassed newspapers and radio in popularity and now ranks just behind TV. Looking closer at the data, some clear patterns emerge between the age groups. For instance, Millennials overwhelmingly go online for news (82% do this in a typical day, compared to 61% of all adults), but are less likely than older generations to get their news from a local television station (78% of all adults do this, including 90% of adults age 74 and older).